they will surely abolish us. The terrorizing capability to obliterate life on Earth with nuclear war was conceived 70 years ago. Its potential began to manifest in the late 1950s, and was wholly produceable by the 1960s when arsenals of multi-megaton hydrogen bombs numbered in the thousands and ICBMs were deployed. On February 28 of this year, physician and anti nuclear campaigner Dr. Helen Caldicott convened a Symposium on The Dynamics of Possible Nuclear Extinction (DPNE). In 1945, Albert Einstein said, “The release of atomic power has changed everything except our way of thinking.” In 2015, seventy years later, we are still stockpiling nuclear weapons in preparation for nuclear war. Our continued willingness to allow huge nuclear arsenals to exist clearly shows that we have not fundamentally grasped the most important truth of the nuclear age: that a nuclear war is not likely to be survived by the human species. 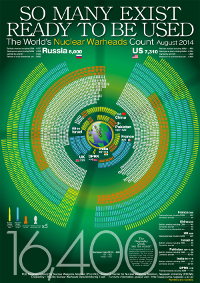 Russia and the U.S. possess about 93% of the 16,400 nuclear weapons in today’s global nuclear arsenal. Russia has about 8,000 intact nuclear weapons and the US has about 7,300. France comes next with about 300 and the remaining 6 nuclear states have fewer than that. What's new in this work? A nuclear war between any nuclear states using much less that 1 percent of the current nuclear arsenal will produce climate change unprecedented in recorded human history. Over the past few years, we have seen the start of a fundamental shift in the way that governments talk about nuclear weapons—not the governments of nuclear-armed nations or their nuclear-weapon-loving allies, who remain firmly stuck in cold war thinking, but the rest: the other hundred or more members of the family of nations, constituting the overwhelming majority. Possessing the bomb, it is worth remembering, is not normal. Almost every nation in the world has made a legal undertaking never to acquire nuclear weapons. But for many years, these nations have taken a back seat in disarmament debates, waiting patiently, idly, hoping that the promise of Prague, and every other promise, would be realized. But no longer. The so-called humanitarian initiative on nuclear weapons has emerged because of mounting frustration at the failure of nuclear-armed nations to fulfill their decades-old disarmament commitments under the NPT. It has emerged out of recognition that simply bemoaning their inaction, no matter how loudly, is not an effective strategy for achieving abolition. Indeed, why would we expect the nuclear-armed states to lead us to a nuclear-weapon-free world? Why would they willingly, happily give up weapons that they hold so dear, that they perceive as the ultimate guarantor of their security, that they believe give them prestige and status in international affairs? Meeting as we are at the Academy of Medicine, it is perhaps appropriate to draw an analogy with the banning of smoking in public places.... We would never expect the smoking community to initiate and lead efforts to impose such a ban. In fact, we would expect them stridently to resist it. The non-smoking community (the majority)—who wish to live and work in a healthy environment—must be the driving force. That should be obvious. Similarly, it is the non-nuclear-weapon states on whom we must depend to drive a process to ban nuclear weapons, to stigmatize them, to make them socially and politically unacceptable, to make it harder for nations to get away with possessing and upgrading them, and to help the nuclear-weapon states overcome this awful, debilitating addiction. This flips the traditional arms-control approach on its head. The humanitarian initiative is about empowering and mobilizing the rest of the world to say “enough.” It is about shifting the debate from “acceptable,” “safe” numbers of nuclear warheads to their fundamental inhumanity and incompatibility with basic standards of civilized behaviour. It is about taking away from the nuclear-armed states the power to dictate the terms of the debate and to set the agenda—and refusing to perpetuate their exceptionalism. non-nuclear-weapon states can and should take the lead to prepare for and negotiate a global treaty banning nuclear weapons, which will create an indisputable obligation for the nuclear-weapon states to eliminate their arsenals. 4-5 March 2013, Oslo: Norwegian Minister of Foreign Affairs, Mr. Espen Barth Eide hosted an international conference on the Humanitarian Impact of Nuclear Weapons. 127 governments, UN agencies, international organizations, and members of civil society participated. 13-14 February 2014 Nayarit, Mexico: In his summary of the meeting, the Chair of the second conference called for the development of new international standards on nuclear weapons, including a legally binding instrument. 8-9 December 2014 Vienna: The Vienna Conference was attended by 158 States, constituting a broad spectrum of international organisations from the UN system, the Red Cross and Red Crescent Movement, many academics and experts and several hundred representatives of civil society. Austria presented a Pledge highlighting its conviction that efforts are needed to stigmatise, prohibit, and eliminate nuclear weapons and this Pledge says that Austria will pursue measures to “fill the legal gap” for prohibiting and eliminating nuclear weapons. As more states endorsed it, this became the “Humanitarian Pledge” in May 2015. As of September 2, 114 nations have formally endorsed this Pledge. The Non-Proliferation Treaty falsely divides the world into nuclear-weapon states and non-nuclear-weapon states. In reality, there is a significant group in the middle: 30 or so nations that claim the protection of U.S. nuclear weapons. They reinforce the idea of nuclear weapons as legitimate, useful, and necessary instruments. The humanitarian initiative has shone a spotlight on these enabler states, known less affectionately as “weasel states,” and they are scampering. They are not used to this level of scrutiny. They have always claimed to be committed to disarmament. But are clearly part of the problem—and that we can change. I encourage you to read and study a penetrating 2-page summary by Wildfire concerning the What, Why, How, Where, Who, & When of “A treaty banning nuclear weapons”. There are more elements to explore in the What To Do section as well as other relevant information presented in the DPNE collection to inform and inspire. Please share with everyone you know. Thank you. The shortcut link to a collection of is: <ratical.org/ne>. Here you will find background on the Symposium, complete transcripts with inlined slides of 8 speakers (soon to be 9), mp3s of all speakers plus the Q&As, additional educational materials, and means to engage with people working to abolish nuclear weapons. Dr. Alan Robock is a Distinguished Professor of Climate Science in the Department of Environmental Sciences at Rutgers University. Professor Robock has published more 350 articles on his research in the area of climate change, including more than 200 peer-reviewed papers. His areas of expertise include geo-engineering, climatic effects of nuclear war, effects of volcanic eruptions on climate, regional atmosphere-hydrology modeling, and soil moisture variations. He serves as editor of Reviews of Geophysics, the most highly cited journal in the U.S. sciences. His honors include being a Fellow of the American Geophysical Union, the American Meteorological Society, and the American Association of the Advancement of Science, and recipient of the AMS Jule Charney Award. Professor Robock is a lead author of the 2013 Working Group 1 for the Fifth Assessment Report of the Intergovernmental Panel on Climate Change which was awarded the Nobel Peace in 2007. Steven is an Associate member of the Nuclear Age Peace Foundation and has been published by the Bulletin of the Atomic Scientists. His writings appear on the websites of PSR, the Nuclear Age Peace Foundation, the Moscow Institute of Physics and Technology Center for Arms Control, Energy and Environmental Studies, Scientists for Global Responsibility, and the International Network of Scientists Against Proliferation. From 2007 through 2011, he worked with the governments of Switzerland, Chile, and New Zealand, in support of their efforts at the United Nations to eliminate thousands of high-alert, launch-ready nuclear weapons. Mr. Starr is also an expert on the environmental consequences of nuclear war, and in 2011, he made an address to the U.N. First Committee describing the dangers that nuclear weapons and nuclear war poses to all nations and peoples. He has made presentations to Ministry Officials, Parliamentarians, Universities, citizens and students from around the world, and specializes in making technical scientific information understandable to all audiences. Weapons that operate on their own without human supervision are termed autonomous weapons, also known as lethal autonomous robots. In a statement issued to mark the 70 year anniversary of the atomic bombings of Hiroshima and Nagasaki, the Association for Aid and Relief of Japan (AAR Japan) has renewed its call to prevent fully autonomous weapons from ever being created through a pre-emptive and comprehensive ban on their development, production and use. See: “Prevent another Hiroshima or Nagasaki,” and the Campaign to STOP Killer Robots. youtube: ICAN statement on UN International Day for the Total Elimination of Nuclear Weapons, Tim Wright, Asia Pacific Director of the International Campaign to Abolish Nuclear Weapons (ICAN), delivers a statement at the UN in New York on 26 September 2014 to mark the first-ever International Day for the Total Elimination of Nuclear Weapons. Footage courtesy of UN Webcast. The Non-Proliferation Treaty (NPT) was opened for signature in 1968 and entered into force in 1970. Article VI states: “Each of the Parties to the Treaty undertakes to pursue negotiations in good faith on effective measures relating to cessation of the nuclear arms race at an early date and to nuclear disarmament, and on a Treaty on general and complete disarmament under strict and effective international control.“ The NPT nuclear weapon states (U.S., UK, Russia, France and China) are in violation of their treaty obligations by continuing to modernize their nuclear forces and by failing to negotiate in good faith for nuclear disarmament (45 years since entry into force of the treaty does not meet the definition of at an early date). For the same reasons, the four nuclear weapon states not party to the NPT (Israel, India, Pakistan and North Korea) are in violation of customary international law. Nuclear-weapon states will not engage in negotiations on a comprehensive nuclear disarmament treaty. Not now, not ever. Negotiating detailed disarmament procedures and verification provisions for nuclear weapons is vastly complex - and pointless without the participation of the nuclear-weapon states. The so-called step-by-step approach has got nowhere. This will not change. The NPT legitimizes nuclear weapons. It holds the non-nuclear-weapon states in thrall, powerless and paralyzed by their good intentions, as eternal supplicants to the nuclear powers. The civil society effort to abolish nuclear weapons is flailing. Without a clear, achievable short-term goal, it cannot unify, focus or exert effective pressure on governments. All the cards are on the table. The catastrophic consequences of any use of nuclear weapons are understood. The motivations of the nuclear-weapon states are clear. Further research, commissions, studies, analysis, eminent windbags and general whining will add nothing. The key: separate prohibition from disarmament. Outlaw nuclear weapons now. Disarmament will follow later. Negotiate, conclude and bring into force a ban. Negotiate the disarmament and verification process. Nuclear-weapon states need not be involved in step 1. Nuclear weasel states (NATO members and other umbrella-dwellers) need not be involved in step 1. Step 1 could be achieved in as little as two years. There are around 140 states which could start step 1 now. that completely and permanently bans the acquisition, possession, transfer and use of nuclear weapons: no exceptions, no loopholes, no withdrawals. that non-nuclear-weapon states parties to the NPT may join freely. that nuclear-weapon states (NPT parties or not) may join after entry into force by negotiating an accession protocol stipulating time-bound disarmament steps and verification provisions (Step 2). Stand Up Against Nuclear Weapon Financing: find out if your financial institution is investing, or is one of those with a good policy on nuclear weapons by studying the 2014 annual report of Don’t Bank On The Bomb. This significant publication gives everyone an opportunity to contact their bank or other financial institution. No one can do everything, but everyone can do something. Inform yourself and those you know about the intelligent and coherent strategies to outlaw nuclear weapons being reflected and produced by Wildfire. On 24 April 2014, the Republic of the Marshall Islands filed lawsuits against all nine Nuclear Weapon States in the International Court of Justice and, separately, against the United States in U.S. Federal District Court. The Non-Proliferation Treaty has been in force for over 44 years. The Nuclear Weapon States continue to rely heavily on nuclear weapons and are engaging in modernization programs to keep their nuclear weapons active for decades to come. The time has come for the Nuclear Weapon States to be held accountable for their inaction. Finally, be clear that educating ourselves and others serves Life’s needs here on Earth and gives significance and purpose to our days. Learning more about implementing a treaty banning nuclear weapons increases consciousness of the overriding necessity to do so. The following work of art, produced by Chris Jordan photographic arts, visualizes “the enormous power of humanity’s collective will.” E Pluribus Unum is a striking indicator—as of 5 years ago—of how many people on Earth are engaged in engendering a world of inclusion where everyone and everything belongs. 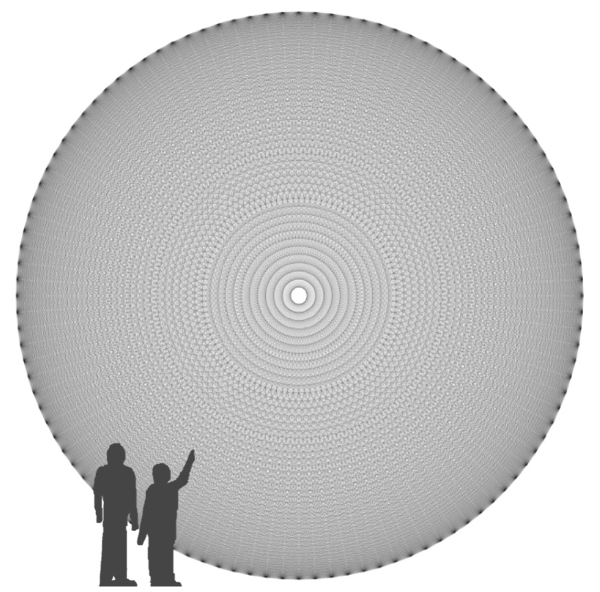 You must visit the page itself to apprehend the magnitude of what is being represented by zooming out from within this visualization. To be sure, there are a wealth of disturbing facts visualized by Jordan’s portfolio of works. Still, as with all eternal opposites, forever joined like two sides of a coin, there is also the life-affirming expression of the “enormous power of humanity’s collective will” to understand and be informed by. This power is what we must ALL engage, direct, and focus, to close the book on the possibility of extinction by nuclear weapons, for the sake of the children, all we share Earth with, and all that is yet to be born and live out lives here long, long, long after we are gone.